Course Website: Official Website - Visit Stone Canyon Club's official website by clicking on the link provided. 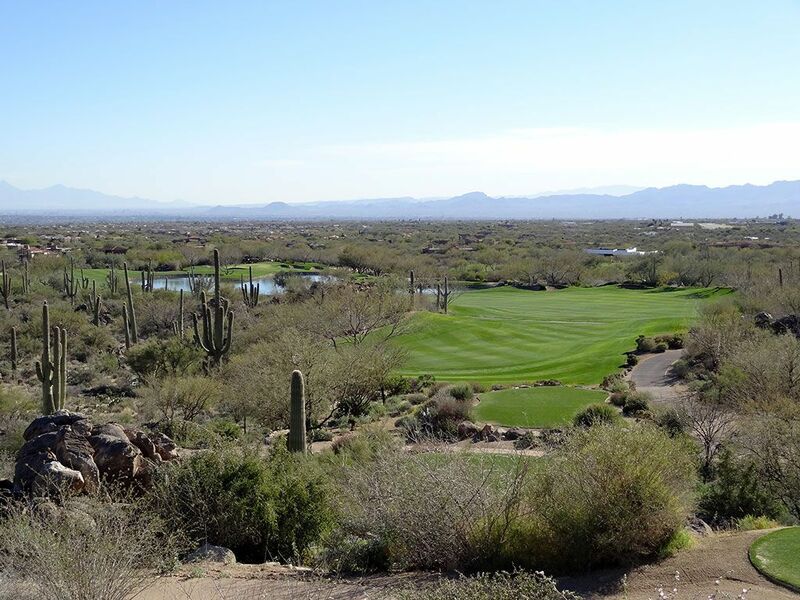 Accolades: Ranked 3rd in Arizona on Golf Course Gurus' Best in State list. 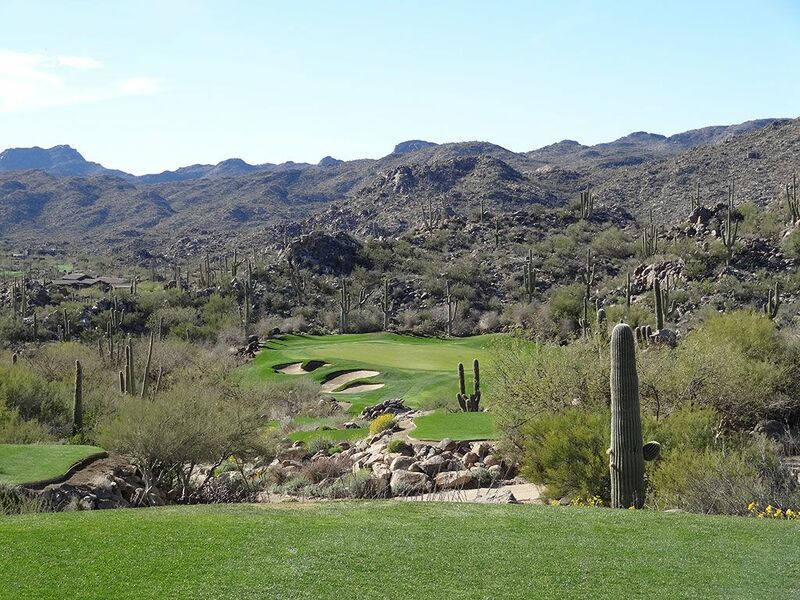 What to Expect: Located in Oro Valley about 20 miles north of Tucson, Stone Canyon is one of the most appropriately named courses you'll come across. 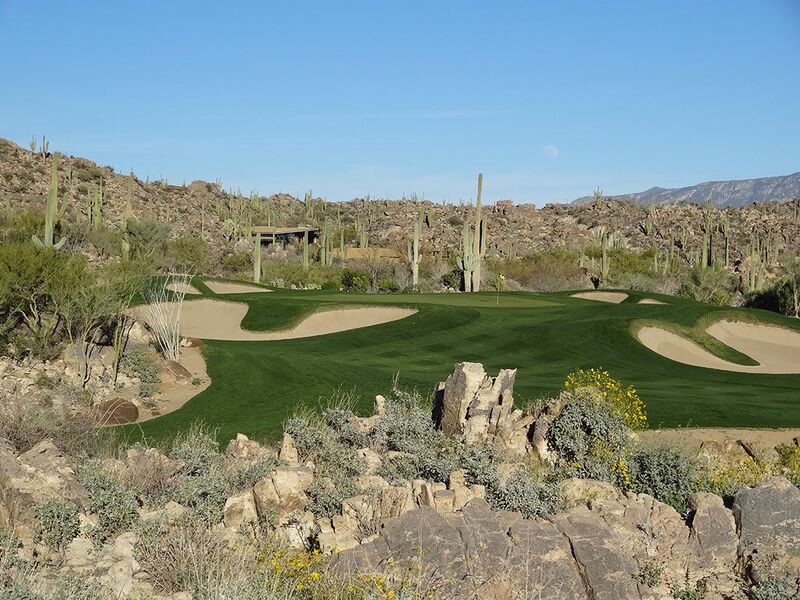 Lying next to the Tortolita Mountains, the course is carved through the vast boulder filled canyons of this expansive 1400 acre property that is peppered with a most impressive collection of large saguaro cactus'. The terrain sets up for a dramatic golf course that features exhilarating cliff-side tee shots, impressive landscaping, and stunning views. The playing corridors are generous though severely wayward shots will result in donating a ball to the extreme desert terrain. 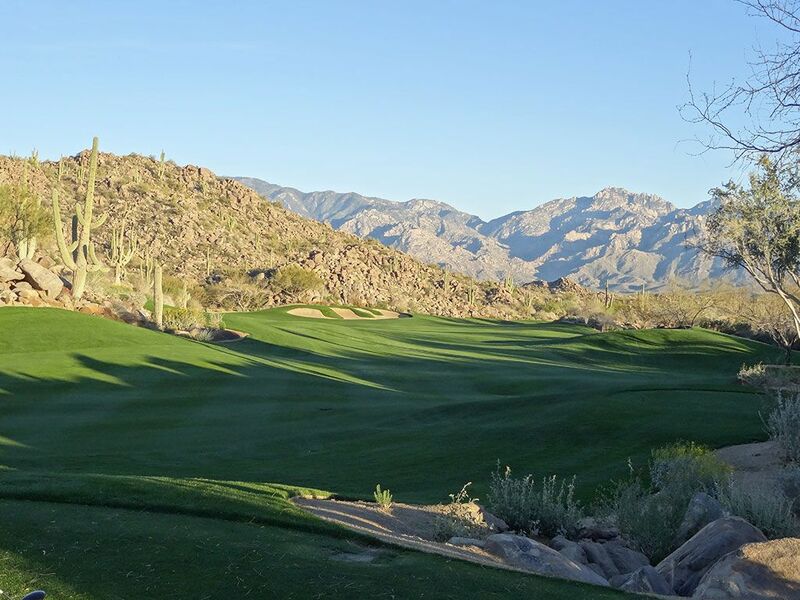 Conditioning is clearly a large point of emphasis at Stone Canyon as the course is as finely manicured as any you'll come across in the Southwest desert; not just in terms of the healthy turf but also with general grooming of the surrounding desert landscaping. The layout is far from traditional so players that adore old classic style courses may find that Stone Canyon isn't their flavor, but those that appreciate adventure style golf through extreme terrain will thoroughly enjoy the course. The golf shop, spa, dining, golf course and entire operation at Stone Canyon is first class in every way and one of the most impressive private facilities in the Southwest. Signature Hole: 6th Hole – 145 Yard Par 3 – It is no coincidence that the most expensive hole to build at Stone Canyon is also its signature. The reportedly $2 million dollar hole features an elevated green framed by a pond in the front that is fed by a series of rock waterfalls that start on the left and cascade down. 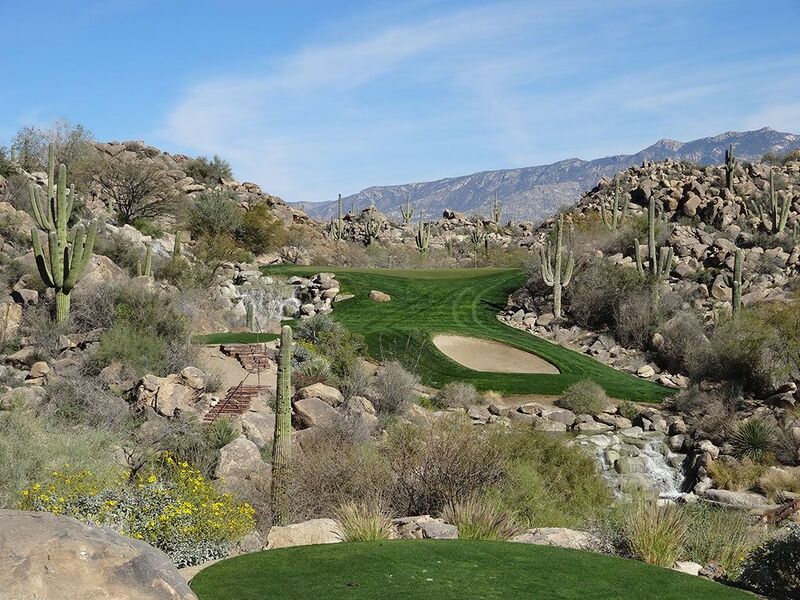 Boulders and mature saguaro cactus' canvas the hill on the right side of the green as a reminder that you are still in the Arizona desert. The front of the green slopes steeply towards a large bunker thus putting a premium on taking enough club to reach the middle of the putting surface with your tee shot. There is more room in the back of the green then you can see, so if you are between clubs it is best to take the longer of the two. It is certainly a memorable and enjoyable hole to play, though I'm not sure the end justifies the means. Best Par 3: 9th Hole – 227 Yards – The 9th plays moderately downhill with the green angled away from the player from front right to back left. Bunkers protect the inside of the green and make the back left pin location the most demanding to hit close to. The bail out area is short right where a portion of fairway is offered to land in if you are feeling very daring. With the boulder covered hill acting as the backdrop and saguaros dot the landscape. Best Par 4: 18th Hole – 503 Yards – A flat out picturesque and demanding finishing hole! With an elevated tee, mountain backdrop, and dark green fairway; you'll want to pull out your camera one last time to capture the moment and the scenery. The fairway slopes from left to right and features a rock and cactus outcropping in the middle of the fairway which demands players to pick one side or the other to hit to, though bombing it over the top is an option as well. Hitting to the safer right side can result in a blind approach to the green whose view is impeded by the native landscape encroaching into the fairway. A large bunker rests left of the green but the front is wide open and thus receptive to a low running/skipping shot onto the putting surface. In the end, Stone Canyon's finisher is one of the strongest in the state. Best Par 5: 10th Hole – 622 Yards – The opening hole on the back nine features the largest water hazard on the property and is just ten yards shy of being the longest hole on the course. This double dogleg dares you to cut the first corner off the tee due to the significant drop in elevation and huge advantage it offers. A small collection of rocks and trees paired with a bunker squeeze down the fairway to a needle hole width thus forcing players to either play over them while laying up to the second dogleg or rip your approach over the water directly to the green. If going for the green in two, a significant amount of green depth is offered to work with but not a ton of width. The 10th hole offers options while still demanding proper positioning and execution from tee to green. Birdie Time: 17th Hole – 306 Yard Par 4 – My favorite kind of hole; a driveable par four. Accuracy is demanded on this tight hole that is framed by trouble on each side. A trio of bunkers pinch the fairway in the layup landing zone while four bunkers lie in wait at the green. The elevated tee will help players generate extra yards and tempt players to take a rip at the green. From a match play perspective, I can't think of a better place in the routing to offer such a high risk/reward hole than the 17th. Bogey Beware: 15th Hole – 632 Yard Par 5 – After playing Stone Canyon, there is one thing you will are certain to have a strong opinion about when you are done; the controversial 15th hole. Already playing to a punishing 632 yards, the 15th hole has a devilish design that has easily put more "others" on players' scorecards than any hole on the course. 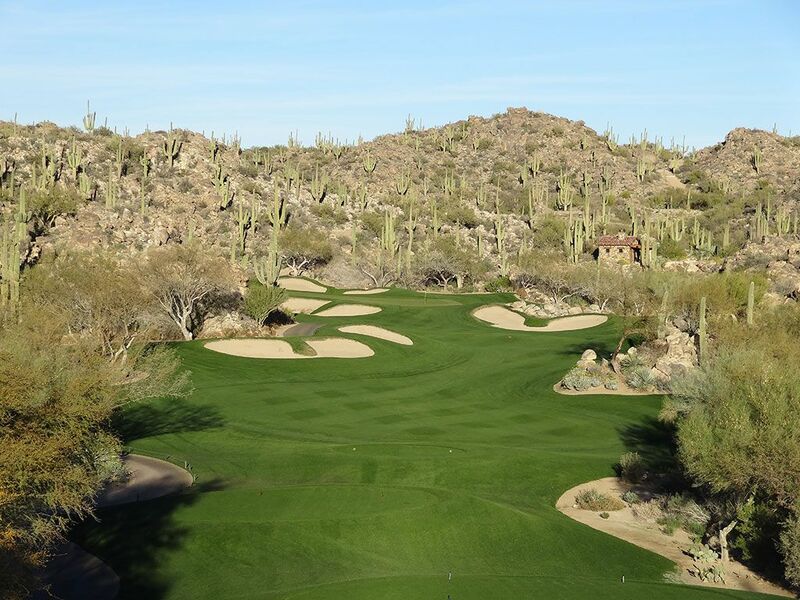 From an aerial view the fairway looks like a slithering snake as it winds over and around the rock outcroppings that boast saguaro cactus' every few feet. The undulated and winding fairway can create some blind shots while the large waste area fronting the elevated green generates a brutal approach shot if you chose to layup on one of your first two shots. Deciding which outcroppings to try and hit over, which bunkers are most penal to avoid, and still generating enough length to reach the green in regulation is an utmost challenge. The T-bone shaped green narrows towards the back and is surrounded by four bunkers. If you manage a par here you are a rock star!